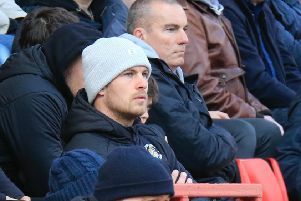 The emerge of Town youngster Harry Isted this season means Luton now have very little to choose from in their goalkeeping department according to boss Nathan Jones. With Marek Stech missing almost three months due to a hernia operation, only returning to the bench on Saturday, Isted has deputised in his place. He made his full debut in the Checkatrade Trophy win over Brighton U21s and kept his place against MK Dons, catching the eye with a brilliant second half double save, while he commanded his area impressively as well. With Shea likely to be rested for tomorrow’s Checkatrade Trophy tie at Peterborough, Jones faces a choice between the two keepers, saying: “The good thing about Marek’s enforced rest, or recuperation, is it has given Harry an opportunity, which he’s taken. “I spoke to him the other day and said now there’s no clear one, two, three in any kind of way and this is what we want. “Harry Isted is now a lot closer to the other two than he was, in my eyes and in the clubs eyes, before Marek got injured, so that has been a real positive if I’m honest. “Marek got injured, which wasn’t ideal, but James Shea’s been brilliant since he’s come back in and Harry Isted has stepped up and proved that he’s more than just a third choice developing keeper. On just how Isted, who moved to Kenilworth Road in the summer of 2017, following his release by Stoke City, has developed during his time with the club, Jones added: "He trains so hard, trains so well, he's a really diligent kid, wants to learn, wants to get better, so it’s a good position for us to be in. "We want competition, as others will have a natural number one, that’s good if there’s a gulf in them, but we haven’t got that.